October 16th was a great day of collaboration and learning for our 6th Annual Teacher-Led Institute Day. 24 different workshops were offered in the morning. The workshops were planned and facilitated by 38 staff, 10 students, and 3 community professionals! 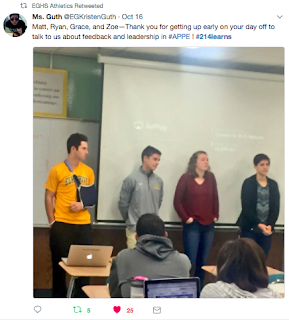 The topics for the workshops were determined in response to a survey shared with staff weeks before, and from feedback from shared from previous professional learning experiences. 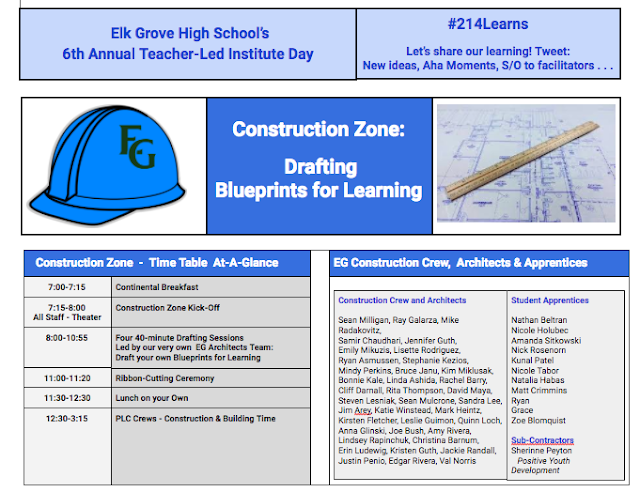 In the afternoon, staff had time to work in their PLCs to share and apply their learning from the morning sessions, and to prepare for a great start the the 2nd Quarter! The following photos and links will give you an idea of what the day looked like. Here is the link to the complete Doc with the schedule for the day. 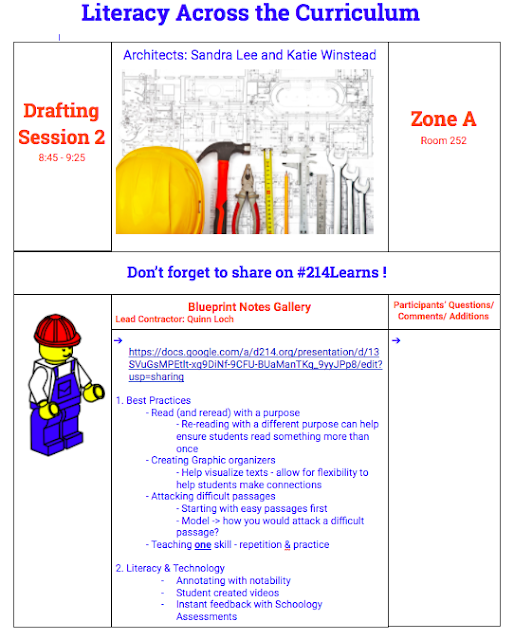 Each session had a "Blueprint" Google Doc for shared notes. These notes will serve as an important an important resource for staff future reference and learning, and to connect to the content of sessions they might not have been able to attend. 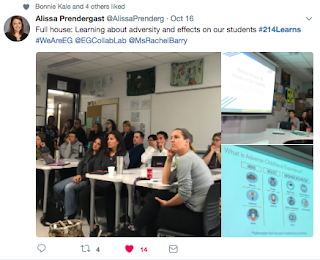 In addition to curating resources in the shared "Blueprints" for each session, we shared our learning via Twitter using our professional learning hashtag #214Learns. Check out this Storify of tweets from the day to see more! The feedback from the day was overwhelmingly positive, and there were great suggestions, too. In addition to conversations with staff, we will be guided by the responses on the Institute Day Survey. Nearly 100 staff completed the survey and the feedback will guide us in planning future professional learning experiences. We have already begun using the feedback to plan our 2nd Quarter Teaming on Tuesday sessions to keep the conversations going. We see the Institute Day as a great springboard for ongoing conversations and learning. This is why Fortis John Deere 35D Trackssources their parts from the highest quality vendors across North America. Not only do we aim to get your tracks and parts to you in a matter of days, but we aim to provide you with parts that will perform, and parts that will last.